Discussion in 'B4R Libraries' started by Erel, May 22, 2016. Someone knows if it is possible to extend the reading range of this module with some antenna and how to do it. V1.01 uploaded to the first post. Fixes a compatibility issue with ESP8266. Peter Simpson and Cableguy like this. That link contained a discussion forum. As I can see..
Any visual or more clear Schematics for this example? If I remember correct I just followed this table when building the example. Johan Hormaza and Beja like this. 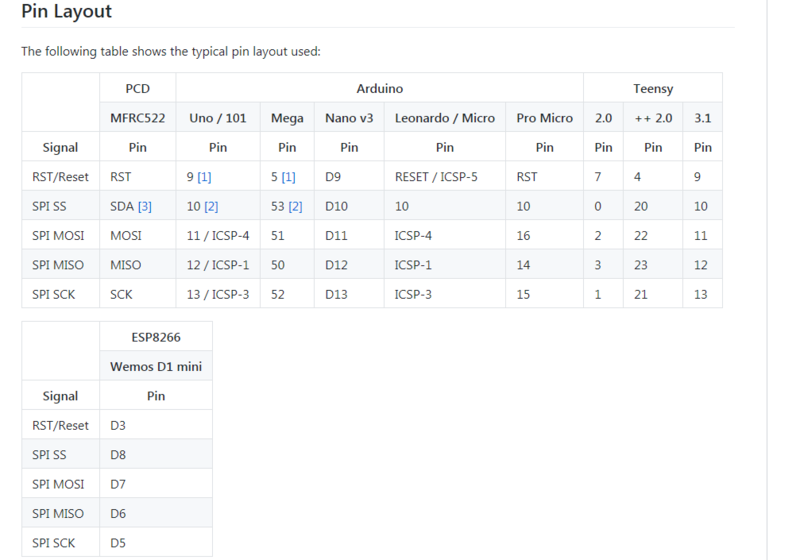 Hello Erel can you post wire connect for ESP32 on your example and needed code modified ? Start with a regular Arduino and get it working. Hi Erel, I tried with the Arduino IDE 1.8.5 with ESP32 and MFRC522 using, for example, an old version of the library selectable from IDE (es. 1.3.6) and i get the error "WARNING: Communication failure, is the MFRC522 properly connected" while with the latest version of the library MFRC522 1.4.3 i don't have the error. Using the rMFRC522.zip library in B4R with ESP32 i get the same error as if the library were not aligned with the latest version available. How can I have library B4R rMFRC522.zip updated to the latest version of the Arduino library MFRC522 1.4.3? Try it with the attached library (v1.02). It is based on the latest version of the open source project. Perfect, now it works. Thank you. Pardon my ignorance.. Where's the UID value logged? Does the arduino have to stay connected to the computer and the value is displayed on the PC screen? Yes. You will see the logs in the IDE.